The United States Marine Corps Birthday is an annual celebration observed on November 10. On this day, a traditional ball and cake-cutting ceremony are held. On November 10, 1775 the Second Continental Congress issued the decree that established the Continental Marines. However, the Continental Marines were disestablished when the American Revolutionary War ended in 1783. 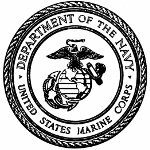 The Marine Corps was re-established by President John Adams on July 11, 1798. The official birthday of the U.S. Marine Corps was originally celebrated on July 11 with little pageantry or pomp. In 1921, it was suggested that the original birthday of November 10 should be declared the official holiday of the Marine Corps. The first formal ball was held on November 10, 1925. Prior to 1952, celebrations took varied forms. They included dances, musical performances, sporting events, and mock battles. In 1952, the celebrations were formalized and standardized. The cake cutting ceremony has been performed since 1956. Traditionally, the first slice of cake is handed to the oldest Marine present, who passes it to the youngest Marine present. The celebration often includes readings, a banquet, dancing, a pageant of uniforms, and a unit run.